The relationship between the United States and China is sliding toward trade war tinged with threat of militarization. The explicit subtext of Trump administration animus toward China is to undermine China steady rise toward economic and technological parity with the United States. From the standpoint of U.S. China bashers, the Made in China 2025 plan to make China a global player in state of the art high technology areas including artificial intelligence, robotics, medical devices, renewable energy, computers and microprocessors, batteries and new vehicles is a threat and not, as it can be, an invitation to further collaboration, joint ventures, and sustainable ecological economic growth. Further, China’s enormous Belt and Road development initiative with global reach is viewed by some as a threat, an exercise in Chinese impudence and imperialism instead of a necessary and useful exercise in global development. Thus, the United States is suddenly harshly critical of El Salvador’s breaking relations with Taiwan in support of Chinese investment in El Salvador, a poor nation desperate for investment and economic development, where economic and social desperation drives many to flee north and attempt to find refuge in the United States. China’s rise for some is a useful tool, tinged with racism, in the America First and Nationalist toolbox. The great risk for both the United States and for China is to recast the relationship between these two nations as a zero sum game where winner takes all which will risk protracted conflict and eventually even war. Confronting China from a U.S. nationalist prospective will help ignite a similar and countervailing Chinese nationalism. In fact, cooperation and leadership by the United States and China is essential for the world to meet the ecological challenge of climate change that threatens global ecological catastrophe and collapse. The U.S. and China are not only the world’s largest economies. They are also the world’s largest emitters. Globally, the best chance to at least mitigate climate catastrophe is for China and the United States to lead an urgent and determined renewable energy transformation. China has become a global leader in solar, wind, hydro development both at home and abroad. China Grid, the world’s largest utility is supporting plans to wire the globe to transmit efficient renewable energy resources from where power is generated to where power is used. The United States should join China in this effort for renewable energy transformation that will require the productive investment of many trillions of dollars. There is no need for the U.S.and China to work against one another in a global renewable transformation. Our common interest is in moving as fast as possible, working together and with other nations and development banks to move on the global task of building the tools that will support the growth of a global ecological civilization. The pursuit of a global ecological civilization is already China’s official policy. The United States has everything to gain and nothing to lose in working together with China and exerting global leadership. This can and should be the basis of a global ecological economic growth multi-trillion dollar investment strategy strategy that slashes pollution, depletion. and ecological damage .and makes economic growth a tool for ecological restoration that ends poverty and supports social and ecological justice. In response to the global financial collapse in 2007-8, the U.S. and the Federal Reserve Bank led a multi-trillion dollar bailout not just to save the economy, but to do so in ways that saved the bankers and speculators, maintaining the economic and political power of creditors and the rich at the expense of debtors and the poor. Without shame, the bankers and politicians almost instantly embraced lemon socialism in 2007-8. Ten years later, trade war with China is threatened because China’s support for high technology development includes a combination of private investment and Bank of China capital. The official capitalist play book is that state “interference” can lead to market distortions and hence over production and eventually market collapse and recession. At bottom, the fear about Made in China 2025 is not of more subsidized and bloated government owned enterprises, but of a successful China industrial policy leading to a series of world class competitive high technology companies. Yes there are differences and challenges. China is not a western style liberal democracy. There are legitimate U.S. concerns over IP (intellectual property), market access and investment opportunities in China. The United States ability to shape Chinese domestic and international policy will be far better served by constructive engagement and joint ventures than by antagonism and trade wars and the belief that China’s economy can be pushed toward collapse for the benefit of the United States. It will be folly for the United States to believe it can benefit in the long run by attempting to confine China to a role as low technology global factory,and as assemblers of high tech gadgets at low cost. China can and will escape this so-called middle income trap. China has already demonstrated for example, through the swift construction of national high speed rail system and enormous renewable energy development that high technology from robotics to artificial intelligence to self-driving vehicles will be made in China and not just in the Unites States or Japan or Germany or South Korea or France. 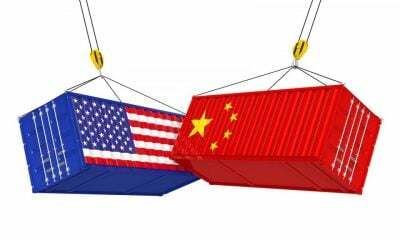 Before the Unites States and China go further down this path of trade war and conflict, we should understand that both short and long term goals for both nations can best be served by cooperation and collaboration and not conflict. Roy Morrison‘s latest book is Sustainability Sutra (Select Books, NY 2017).